Hemodialysis is a procedure that is carried out when a person undergoes renal failure. When you administer hemodialysis to your patient, their blood is pumped into a dialysis machine that filters various salts, wastes and fluids from their blood and purifies them separately. This procedure helps your patient to live a normal life, in spite of their weak kidneys. You need to strictly advise your patient who is undergoing hemodialysis to take their medicine on time, to eat healthy, and to get this treatment regularly. Moreover, you also need to examine their condition on a regular basis. 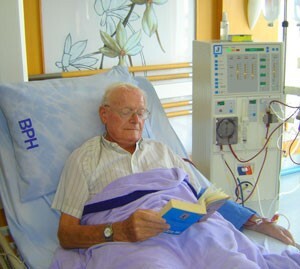 Most people receiving hemodialysis treatment suffer from several problems. Being their healthcare provider, it is your duty to inform them beforehand of all the possible risks that they could face, as well as how to handle them suitably. Let’s take a look at some of the commonly experienced difficulties during hemodialysis and how you can help your patient take care of them. Vomiting or nausea is one of the most commonly occurring problems during the routine hemodialysis treatment. It normally takes place due to a low blood pressure (hypotension) and can be prevented or resolved by prescribing suitable medicines to your patient. Your patient may suffer from mild to severe headaches during hemodialysis. However, giving them acetaminophen (Tylenol) can soothe their headache; or you can also decrease the level of sodium on the dialysis machine to relieve the headaches. Hypotension and low levels of sodium in the dialysis solution often result in muscle cramping. If your patient has a weight lower than the dry weight, they can also suffer from muscle cramping. You must ask your patient to inform you if they get cramps in their hands, feet or legs. In case your patient has cramping along with low blood pressure, then give them saline in the dialysis machine. You can also add glucose or hypertonic saline. If they have cramps in their legs, give them Carnitine or Quinine. Moreover, you can also massage the patient or give them a hot water bottle to place on the area of cramping. When you undergo hemodialysis, you urinate much less often. This may result in an overload of fluid in your body, which can cause uneasiness. To make sure that your patient doesn’t suffer from this problem, advise them to consume a certain amount of fluids per day, so that they do not experience other similar problems, such as edema, breathing issues, high blood pressure and even congestive heart failure. Blood leaks can occur at the point where the needle is inserted into your patient’s arm, but it can take place inside the dialysis machine too. Make sure to secure the needles properly into your patient’s arm, so that this problem does not arise and leave the patient in pain. Your patient can also suffer from neuropathy, which is the impaired functioning of the nerves. Its symptoms are numbness and pain in the feet, tired legs, and a weakness of the arms and legs. When your patient gets an irritating feeling in their calf muscles that is only relieved by moving their feet and legs around, then they are suffering from neuropathy. This condition normally takes place when the patient is resting or sleeping. The exact cause and complete cure of neuropathy is unknown, but frequent dialysis can help you in decreasing the intensity of this condition in your patient. Lots of people undergoing hemodialysis suffer from itching. It results due to an increase in the levels of phosphorous, high levels of the parathyroid hormone (PTH) in the blood, allergic reactions, and dried up skin. Generally, dialysis patients experience itching because of their dry skin, as their skin is unable to produce a sufficient amount of oil to keep it moisturized. Advise your patients to use a good moisturizing lotion and soap, as well as unscented oils. Moreover, allergic reactions to the dialysis machine, dialysis tubes and medications can also cause your patients to itch frequently. Ask your patients to maintain a record of how they feel during each session of hemodialysis, so that you can change their medications or the dialysis tubes accordingly. To check the level of PTH in your patient, you need to ask them to take a blood test. Due to an increase and decrease in the levels of phosphorus and calcium, respectively, your patient’s PTH levels can increase. This can result in bone disease and its symptoms include itching, discomfort in the joints, and severe pain in the bones. To treat your patient for this condition, you need to control the levels of phosphorus and calcium in their body by giving them vitamin D and phosphate binders. Furthermore, ask your patients to take phosphorus binders regularly with every meal. This way, their phosphorus levels will stay normal and the phosphorus-calcium products are not excreted out of their bodies at a faster pace, as this excretion can cause itching as well. Guide your patients about all these problems and their solutions, so that they know the possible risks associated with hemodialysis before taking this treatment.